Welcome to Ko Lanta. This site is supported by Lanta's Resorts and Small Business Community. It is geared to providing you with information about how to get here, where you can stay, what activities you can participate in, how to get around the island and most importantly, what Island-Network Koh Lanta can do for you. For the exact location of hotels and bungalows, please check out our unique Island Maps. A Complete Listing of all hotels and resorts can be found under Hotel List. How to go will explain how you can reach Ko Lanta from Krabi, Trang, Phi Phi Island and Phuket. If you plan to travel on to other islands of the region or you need flight information, all can be found here. For excursions or adventure trips around Koh Lanta Island check out our Activity Guide. If you are interested to get some background information or learn more about the region you intend to chose for your next holiday, please check out the subjects at Articles. If you're looking for the best Eating Out venues then we've got some of the best options on offer listed here, so check them out! To get around Koh Lanta Island you will have to rent a motorbike or car and this can be done at most resort counters. We would also like to recommend you our business partner Ex Oriente Lux from Poland. They organise pretty nice excursions and holidays in Thailand. Feel free to read their trip reviews and travelling programs on www.exorientelux.pl/tajlandia. Koh Lanta Island has a population of approximately 20,000 people, who make their living on fishing, rubber farming and prawn breeding. Today many are working in the tourism industry. The local trade, especially in Saladan is predominantly under the control of Thai's from Chinese descent. 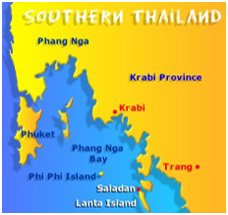 Since 1996 the island has been connected to Thailand's southern electrical grid and since 2001 to the telephone network. The Island can be easily reached by 2 car ferries, that now operate from approximately 06:00 to 22:00. Most streets on Ko Lanta Yai have been paved, some side roads are still unsurfaced. During the last years, the number of resorts along the western coast increased to about 150, offering a choice for everybody's taste. This has worked making Ko Lanta a great retreat from the hustle and bustle of everyday city life. © 2003-2011 Island-Network Koh Lanta. All Rights Reserved. P.O Box 158, Phuket Town 83000, Thailand.